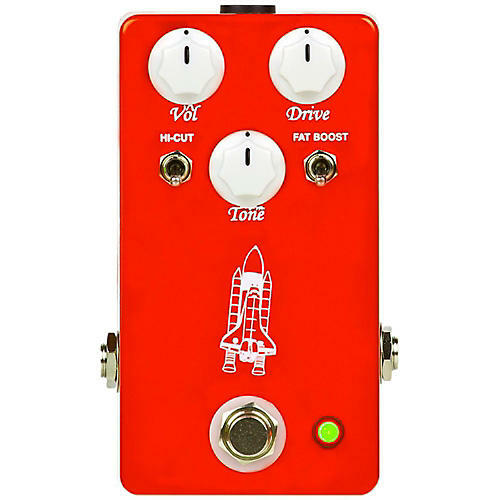 This light to medium overdrive pedal brings out the true, natural tone of your guitar and amp. From light, tube-like breakup to heavy, fat overdrive, the Atlantis has you covered. Great with humbuckers, single coils and P90s, you keep the sound of your guitar and amp without losing any of the bottom end. Flip the "fat boost" switch and add some extra bass to hear this thing really roar. Enabling the fat boost also gives a touch more grit at higher gain settings. Flip the "high cut" switch to cut back on the highest harsh frequencies - an excellent balance for treble-heavy guitars. Balance the tone knob, high cut and fat boost switches for an incredible range of tones. From harsh and thin to heavy, fat and powerful, this really does it all. The Atlantis also gives a great boost to an acoustic guitar, providing extra clarity and body which is great for finger picking. There's plenty of room to spare on all the controls without getting any sort of distortion sound from your acoustic! Dimensions: 4.8" x 2.95" x 2.27"